While watching the NDP and Republican leadership races unfold in Canada and the United States, I’ve been struck by the very different political cultures of these two countries. This can be partly attributed to the divergent political philosophies of the right-wing Republican Party and the centre-left NDP. But the roots of these political cultures also extend much deeper into the histories of these nations. Some media observers in Canada have suggested that in terms of excitement value, Canadian politics come out on the losing side, referring to the NDP leadership race as boring, or comparing the NDP ‘snoozefest’ to the ‘slugfest’ of the Republican race. As boring as Canadian politics may be to many, I for one am grateful to be able to participate in the more diverse political culture that has been built in Canada. Granted, the Republican race has produced some provocative headlines. Newt Gingrich wants to colonize the moon? Mitt Romney lambasted in attack ad for speaking French? Newt Gingrich expands on his support for child labor? Like a character in an archetypal horror film, I can’t resist investigating further, even as I risk the death of my faith in humanity as a result. In comparison, the NDP leadership race has not generated similarly sensationalist headlines. NDP MP Nathan Cullen condemns Harper’s ‘witch hunt’ on environmental charities. Leadership hopeful Mulcair unapologetic about dual citizenship. Nash on early childhood education. The genre might be more suitably cast as documentary, but in the real world of politics, is this really a negative thing? Both leadership races will determine the leader of each nation’s official opposition. But a key difference is that in the United States, the Republicans comprise the only major opposition. 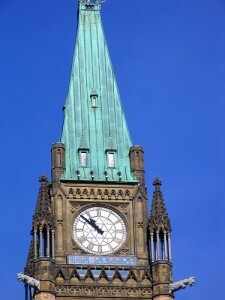 In Canada, opponents of the reigning Conservative Party have a variety of oppositional parties to support, from the long-reigning Liberal Party, to the Green Party, and for some, the Bloc Quebecois. In both of these leadership races, it is not uncommon to hear the word “liberal” infused with negative connotations. Yet the reasons for this could not be more different. In the American context, liberal is frequently used as a catch-all phrase for anyone to the left of the Republican Party. Within a two-party state, the space for oppositional politics is thus more constricted. The rate at which “socialist” is used to describe Democrat policies in the United States, moreover, suggests that some Republican pundits remain unaware of the very real differences between liberalism and socialism. Social democracy has gained a stronger foothold in Canadian politics. Born out of the depression years of the 1930s, the CCF began as a party that explicitly embraced socialism. Later renamed the NDP, it has since come to occupy a centre-left position within a capitalist economic system. Social democracy has nonetheless left an enduring legacy in Canada, perhaps most notably in a system of public healthcare. Calls for the unification of the left in Canada have increased in volume in recent years. However, I fail to see less choice in the political arena as a positive democratic development. A vibrant political culture that can support the growth and development of multiple parties across the political spectrum ought to be celebrated. The political systems in Canada and the United States are both deeply flawed. However, at least those of us who vote in Canada have greater choice when exercising our democratic rights. The fact that the official opposition in Canada can draw together eight intelligent leadership contenders who can respectfully share their vision for building a more socially just country, while boring for some, is very much the result of a more varied and diverse political culture. Political debate in Canada can undoubtedly be more mundane at times. Is it hypocritical to criticize a leadership candidate for holding dual citizenship when our official head of state, the Queen, is not a Canadian citizen? But when all is said and done, I will take a civilized debate over the merits of a system of public childcare over suggestions of subsidizing education costs through the physical labour of poor children any day.